Make sure your Company's branding is on the tip of the customer's tongue with the ideal business gift this summer with our Customised Lollipops. 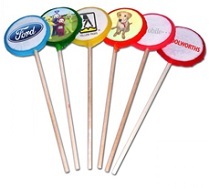 Personalised with full colour print, and a full assortment of colours, you can perfect your Customised Lollipops with corporate branding and logo design printing. Hand these out as a business gift and you will improve both brand-awareness and your profit margins. Why not personalise these Customised Lollipops with your Company branding and hand them out at trade shows and business conventions? Customised Lollipops have full colour printing, and a shelf-life of 18 months! For a FREE QUOTE, please fill in the form regarding our Customised Lollipops and we'll be able to help you.